This space highlights a selection of artifacts from the North Carolina Department of Cultural Resources collections. Many of these images and provenances are accessible from the North Carolina Department of Cultural Resources searchable collections database. 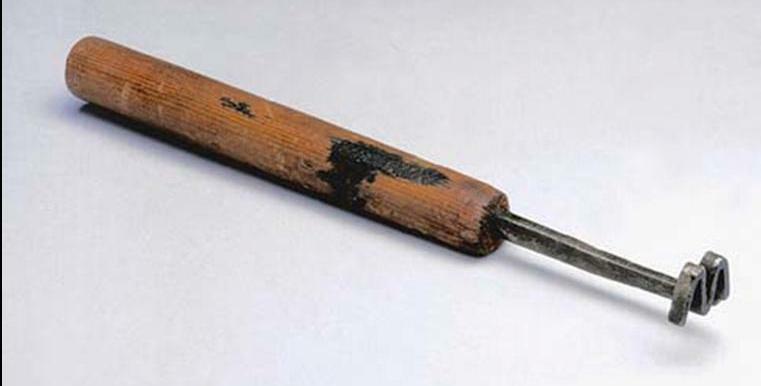 This page also links to 3 auxiliary pages showcasing artifacts from cultural heritage collections across the state: NC Coastal Plain Treasures, NC Piedmont Treasures, and NC Mountain Treasures. We invite you to submit ideas, along with artifact images and provenances, for inclusion. Duplin County records from March 15, 1787 explain that a slave named Darby was convicted of killing his owner, William Taylor, Esq., by striking his head with an axe. 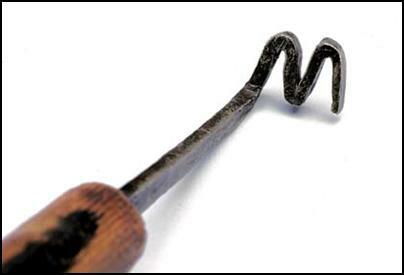 Darby was sentenced to be burned at the stake the following day. Darby’s 14-year-old brother was also convicted as an accomplice in the murder, but because of his youth, he was given a lighter sentence: “between the Hours of one and four o’Clock he be taken out hence and tied to Post on the Court House lott, and there to have one half of Each of his Ears cut off and be branded on each cheek with the letter M and Receive one hundred lashes well laid on his bare back and that the Sheriff see this order Executed.” (from Capital Punishment in North Carolina, p. 10) This piece is currently on exhibit in the North Carolina Museum of History’s “Story of North Carolina” exhibition. In 1812 the General Assembly established what is now the State Library of North Carolina. The original library was located in the old State House, which burned in 1831. 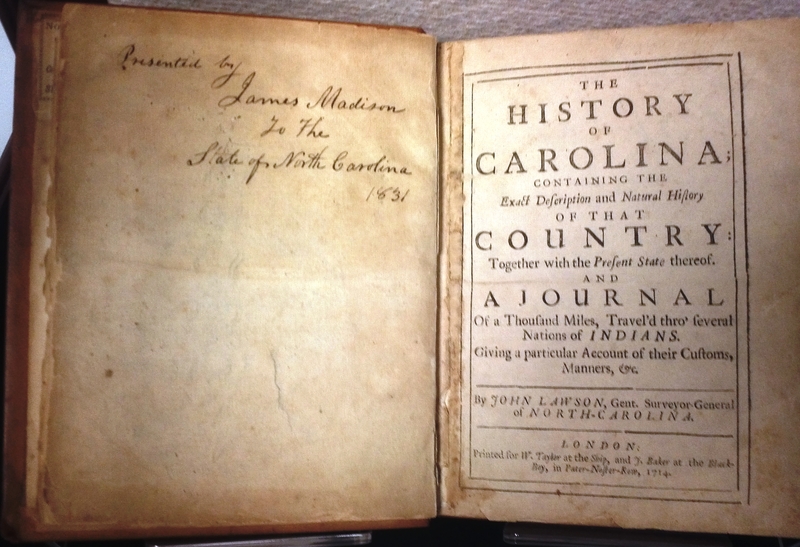 One of the destroyed books was a copy of John Lawson’s The History of Carolina. Former President James Madison read about the loss of the library and donated his personal copy of the 1714 edition of Lawson’s History. The book’s inscription is not in Madison’s hand but probably that of a North Carolina government official. 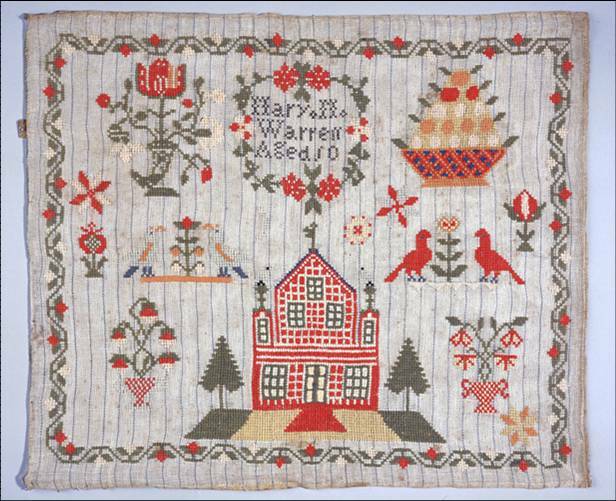 Mary M. Warren of Upper Hominy Township in Buncombe County stitched this sampler between 1846 and 1848 and worked with brightly colored wool. Mary added her name and age in the center medallion. 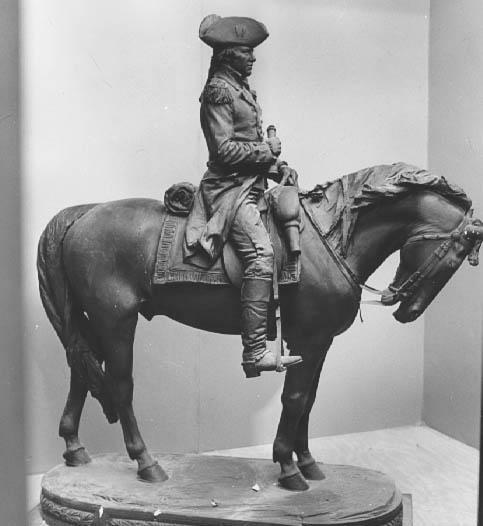 Sculptor Francis A. Packer created this study for the larger monument of General Nathanael Greene at Guilford Courthouse National Military Park. Greene, known as “the Fighting Quaker,” was a Revolutionary War general who led the southern campaign in 1780. Founders named the City of Greensboro–at the site of Greene’s most renowned battle–in his honor. This 1915 commemorative piece is over 7 feet tall and consists of plaster, painted black, on a wooden base. The piece requires extensive conservation before it can be placed on exhibition.